How to tell when you’re getting old… or, Senior Moments… I haz dem. So, after a nice weekend which included a wonderful break to the heat we’ve been having, Monday dawned sunny, cool and breezy. Having been cleared by the physical therapist to attend water Pilates, Supportive Partner Woman wanted to be at the gym by 10:00 for class. I thought that would be an excellent time to go… I could get my cardio in while she was doing the Pilates thing. I had a great workout. 30 minutes and decent resistance on the elliptical, followed by a training loop on the bike. I’m still leery of the treadmill, as I don’t need a blister relapse before vacation. I finished and waited for SPW to emerge from the pool area. We went home and I was browsing through my calendar, wanting to make sure that my scheduled session was in fact at 11:00 tomorrow. Turns out I made a whoopsie and the session was for 11:00 today. That would be 11:00, or 33 minutes earlier than the current time. So, I skipped my session at the gym because I was at the gym. Sigh. I called in and Cory had a good laugh at it… I was still pretty mortified. The sad part is that if I hadn’t decided to check, I probably would’ve missed the Thursday appointment as well, thinking it was on Friday. So, the weekend was pretty good… had an unexpected Saturday off, so SPW and I traveled to Berks County to see her family and I took a side trip to see my mom. See, I’ve been a bad son… I haven’t stopped in to see her for several months. No particular reason, I just got caught up in life. It’s not a good thing, though. There’s more to life than working and not taking enough time for your family. Let’s face it… when it comes down to it, family is all you can really count on. It was nice to see Mom, though. In a surprise move, she was trying to feed me, but I managed to escape without damage. I had stopped at Chick-Fil-A on the way to her house, as my sugar level was starting to go low. I ordered a #1 with a fruit salad, as opposed to fries, and it was very tasty. I probably should’ve gotten a grilled sandwich, but I felt that I needed the carbs. Three hours later, the blood sugar was going low again, so that necessitated me taking a glucose tablet. That held me off until we had dinner. Crab quesadilla with onion rings and green beans. We went to a new place for us, after getting shut out at Bonefish Grille. It’s a place called the Black Knight Tavern and Grille. We’ve been getting mailers from them for a couple of years, just never got around to trying them. Turns out the food is pretty good. Maybe not the greatest cuisine on the planet, but it was serviceable and filling. It also had the advantage of being pretty nicely priced. They offer a couples special. You get an appetizer to share, a choice of two selected entrees, and two small desserts. All for around $25. So, SPW (lover of fine crustaceans!) and I agreed on a crab dip appetizer that was served with some yummy warm bread. For her entrée, SPW went with a grilled swordfish, served with fries and green beans. 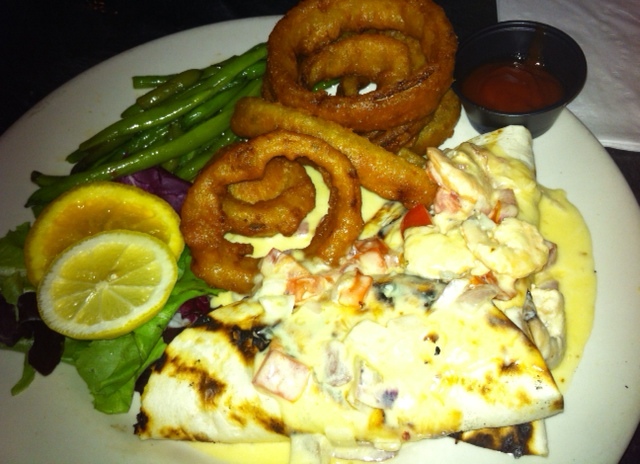 I opted for a crab quesadilla topped with shrimp, served with onion rings and green beans. Like I mentioned earlier, the food is not haute cuisine. It’s basically pub grub, kicked up a notch. My quesadilla was fresh, loaded with plenty of crab meat. The rings were very crispy, and the only drawback with the beans was that they were a little oily. Is this place going to earn a spot on our dining rotation? Probably not. The service was a little slow and the ambience isn’t that great. Our server seemed to have a regular in the same room as us and spent most of her time chatting up the regulars rather than attending to her other tables. I also realize that this probably wasn’t the smartest choice in terms of nutrition, but with my sugars running a little low all day, the carbs were probably a good choice. That’s what it all comes down to… making a smart choice. You have to weigh your options and know that if you had ice cream earlier in the day, you’d be better off having a big salad for dinner. That pretty much sums it up for today. Keep making the good choices… your body will thank you. Hey Brian…what happened at Bonefish Grill? I’ve never eaten at one, but the wife and I talk about it since they’re supposedly good for celiacs. We didn’t know they took reservations and they were predicting a 45+ minute wait. We still hope to try them one of these days.